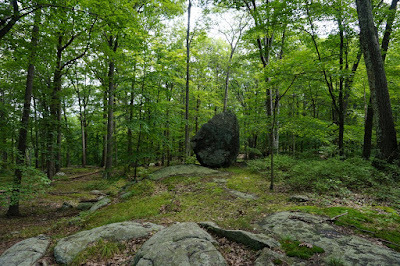 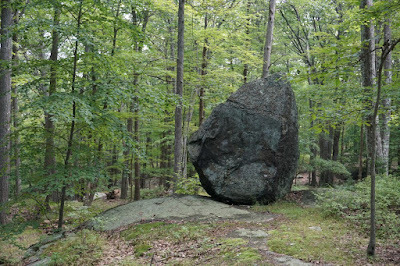 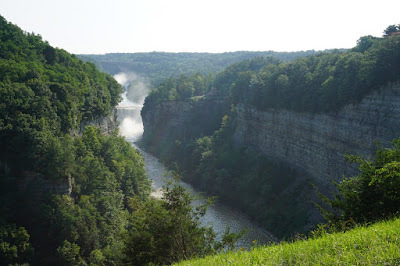 I had just returned from a weeklong camping trip in Letchworth State Park, and back home on Sunday missed my all stomping grounds around the corner, Harriman State Park. 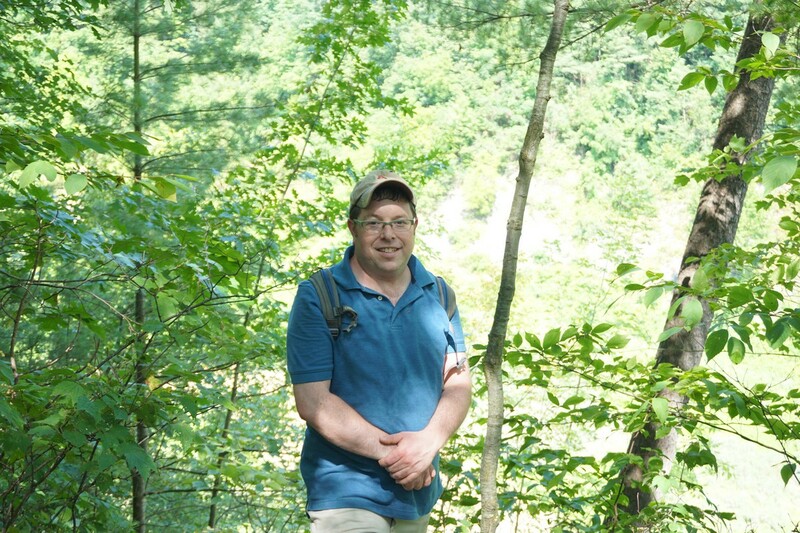 I did a more "toned-down" hike than usual this time, without any strenuous climbs. 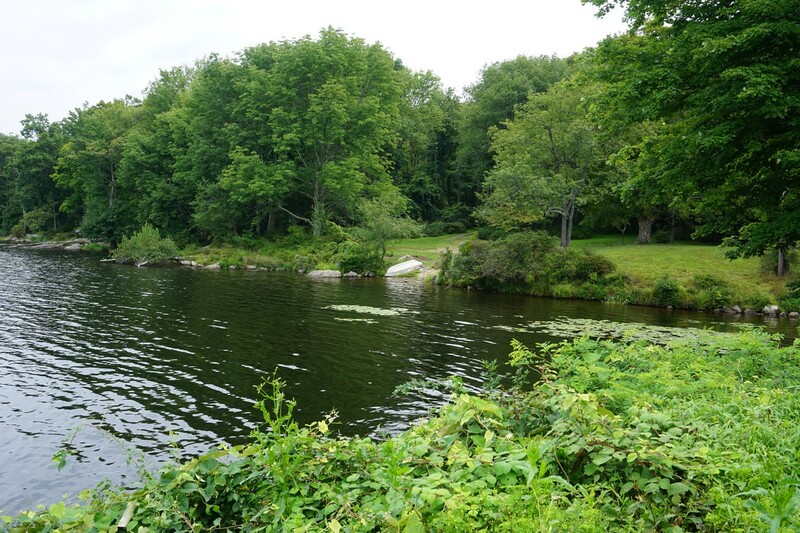 I parked by the Lake Sebago Boat launch, and took the unmarked Ski trail north of the boat launch, crossing Seven Lakes Drive and then to the end of the trail at Pine Meadow Road. 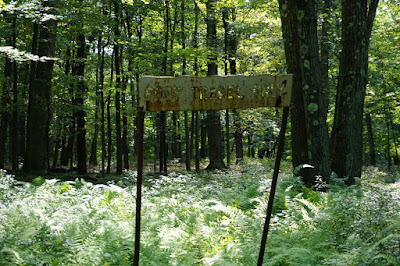 The Ski Trail was somewhat overgrown prior to crossing the road. 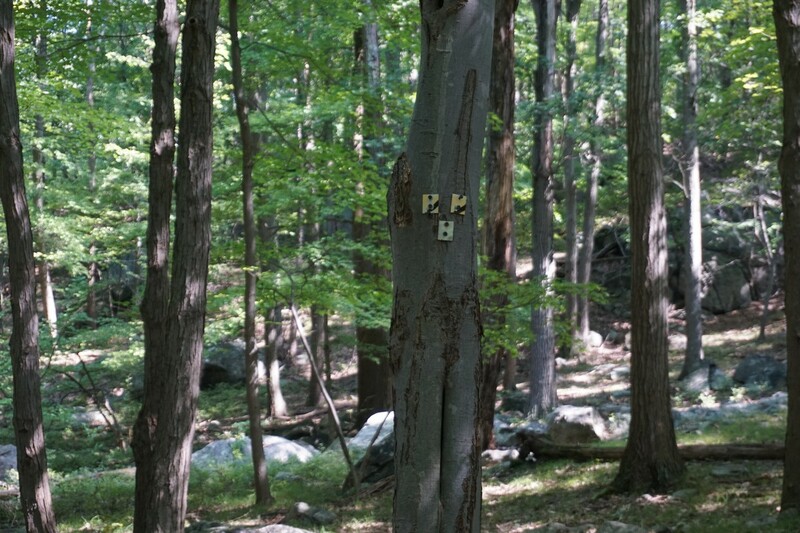 I took Pine Meadow Road until the intersection of the Buck Trail. 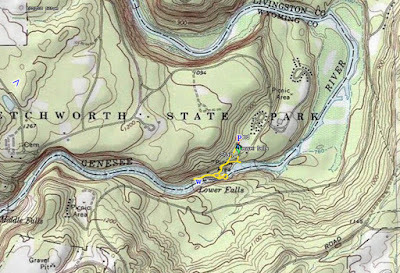 The Buck Trail splits with a northern and western spur. 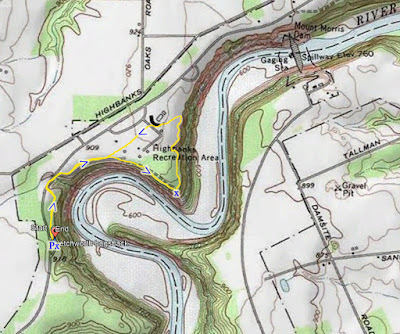 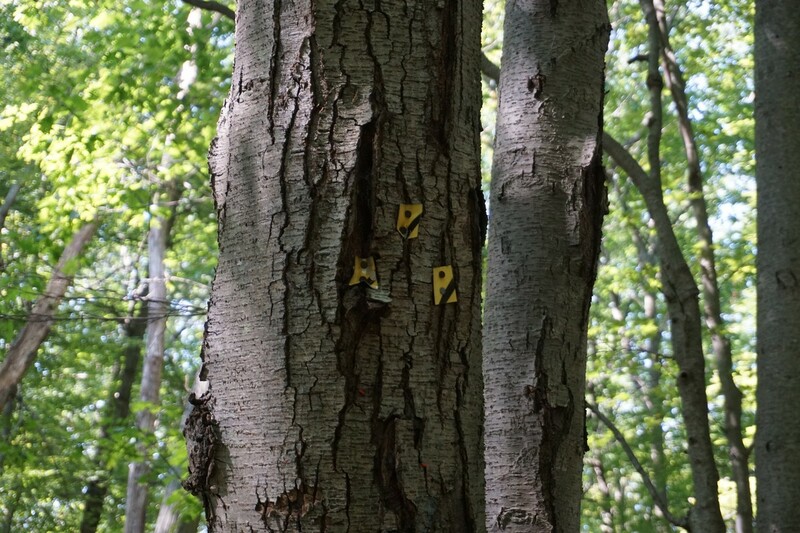 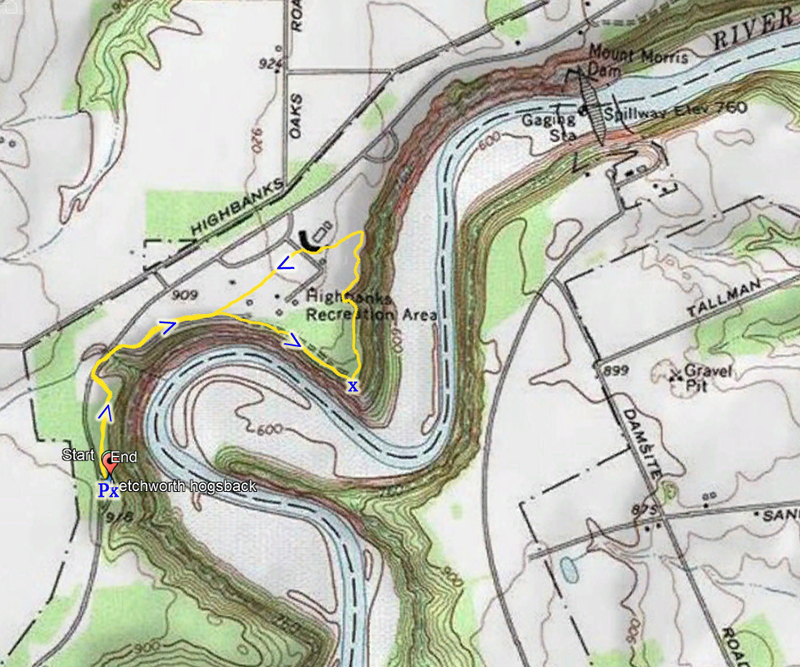 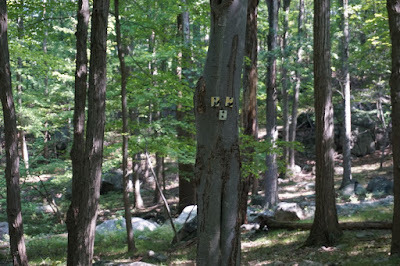 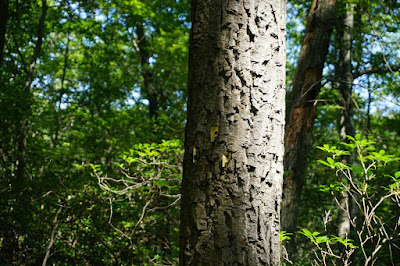 The northern spur is marked with a combined yellow and black blaze, which I took to the main part of the trail, to its terminus at the Seven Hills Trail. 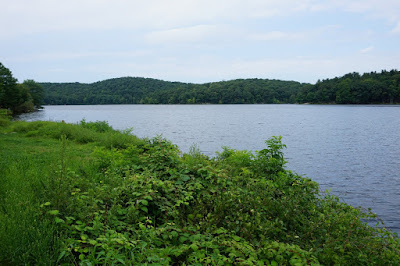 I took the Seven Hills Trail down the steep part crossing Seven Lakes Drive and back to my car at the boat launch parking area. Start of the Buck Trail Northern Spur. Its Easy to Miss this! 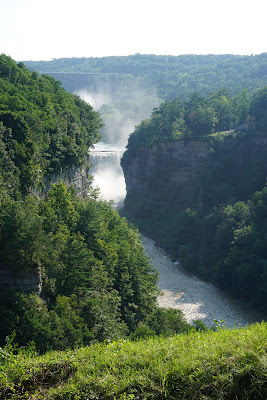 On my last full day camping at Letchworth State Park, I went to the Lower Falls area. 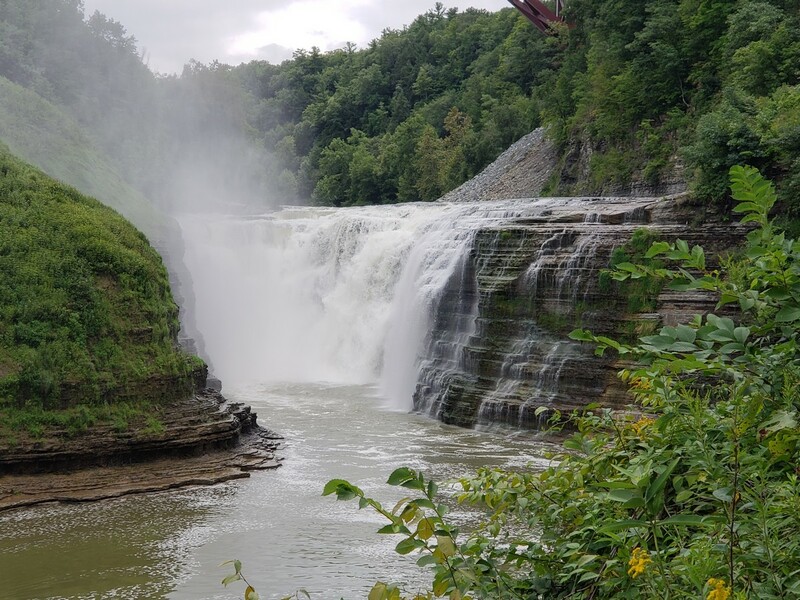 This is the smallest of the waterfalls among the Genesee River Gorge, but is very scenic in a very dramatic area in the gorge. I parked in the Lower Falls area, walking through the picnic area to the edge where there is a fence and somewhat of a view of the falls area. 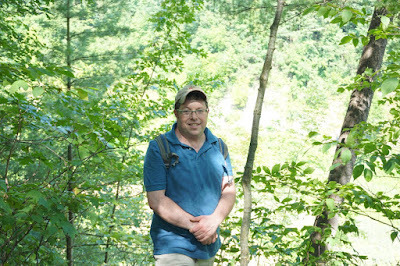 At this point I took the Lower Falls Trail, which goes down to the gorge in a series of steps. 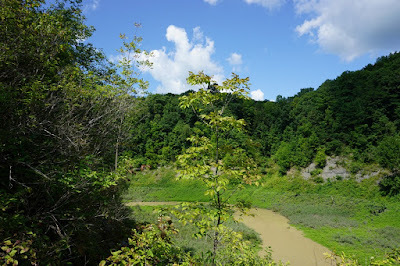 I took this to the falls area, where the trail ends at a dead end. 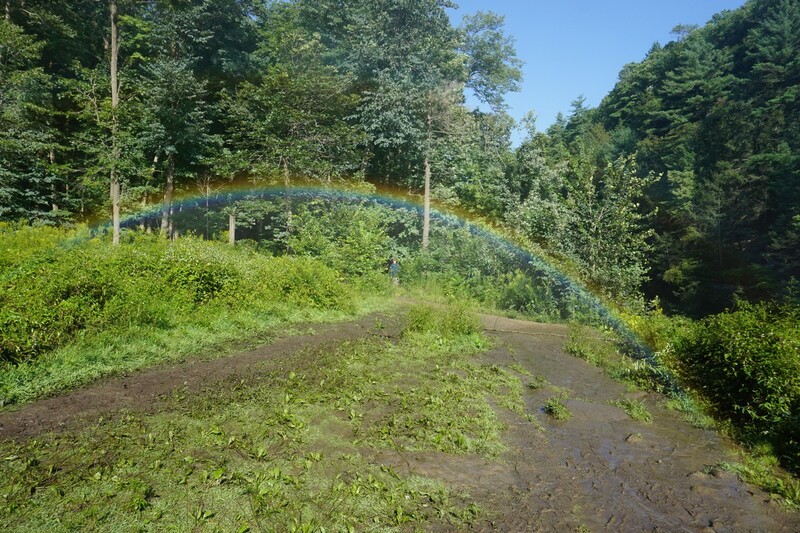 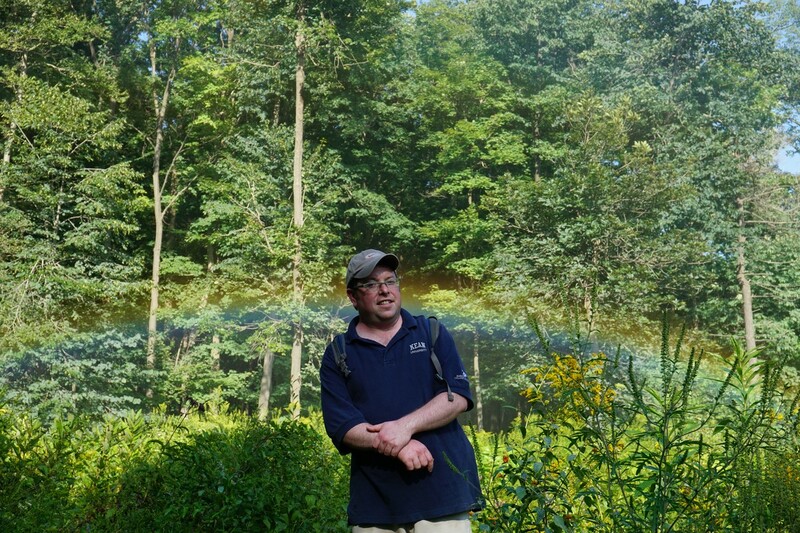 This area was extremely muddy, but also featured an amazing rainbow over a grassy knoll, creating a surreal feeling. 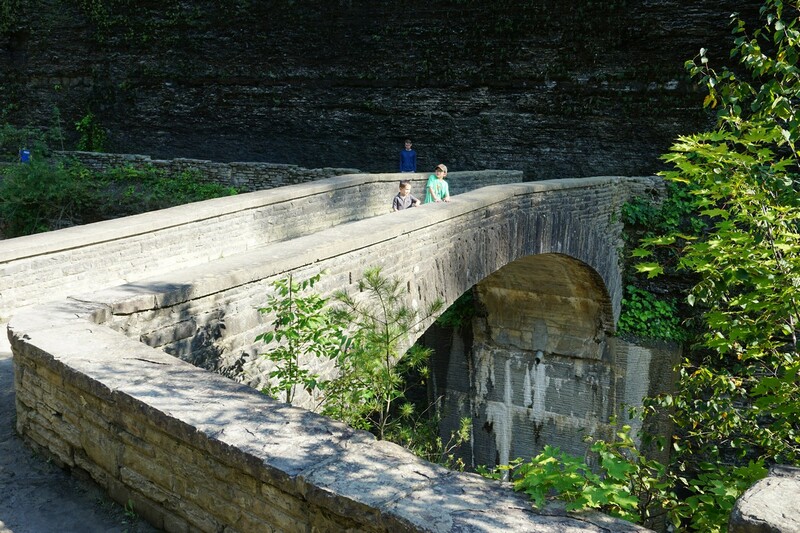 I then turned aroudn and took the trail down to the bridge crossing over the Gorge, at the only trail bridge crossing in the entire park. 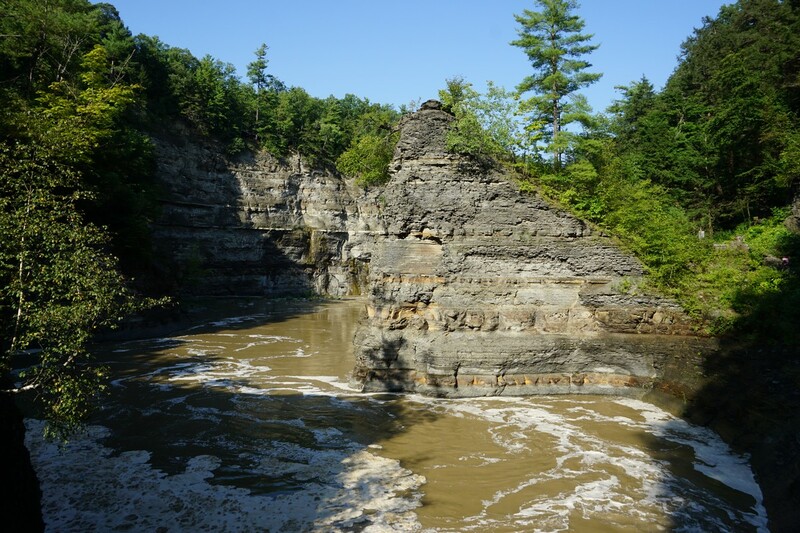 This area of the gorge is very narrown, with sheet canyon walls and strange rock formations. 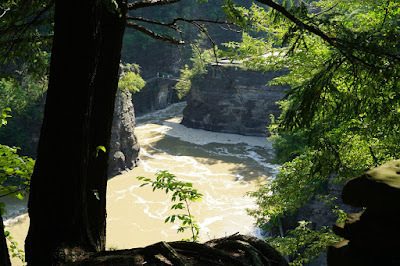 I took this trail a bit longer then turned around, climbed up the large rock platform overlooking the gorge, then climbed back up the steps and went back to my car. 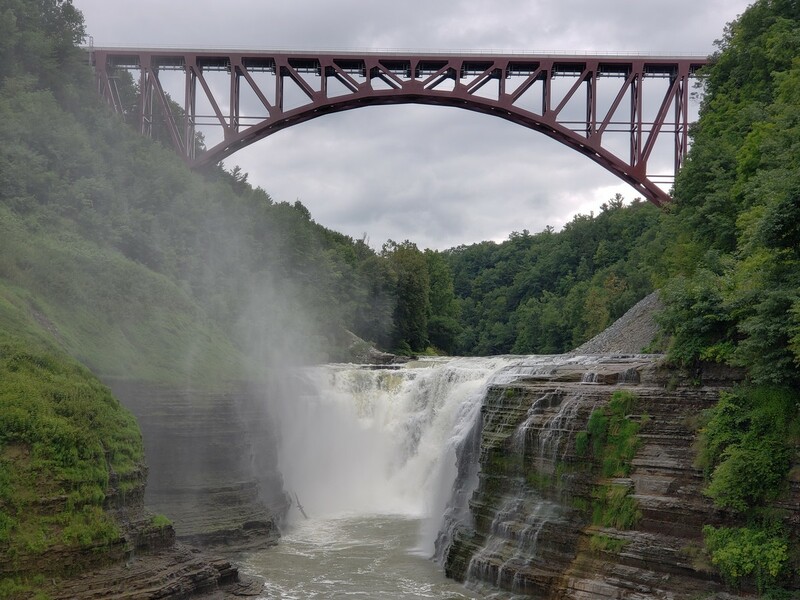 I had originally intended to hike from the Lower Falls along the Gorge Trails to Inspiration Point, which is an overlook high above the gorge where both the middle and upper falls are in sight, with the rail brige high above in the distance. 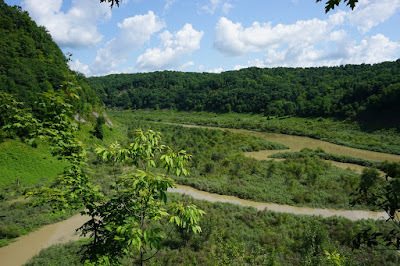 I ran out of time, so instead parked at Inspiration Point at Park Road, and walked around the area and took pictures from there. 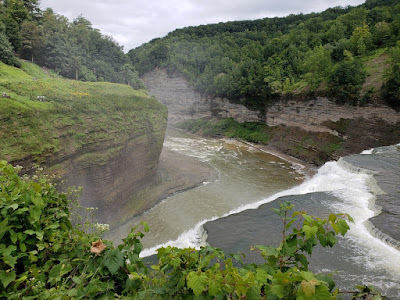 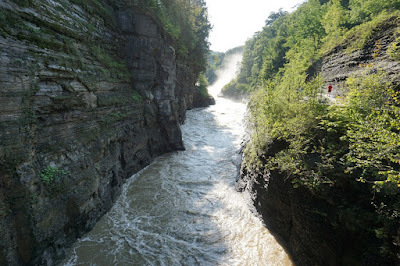 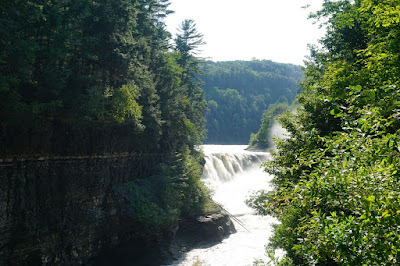 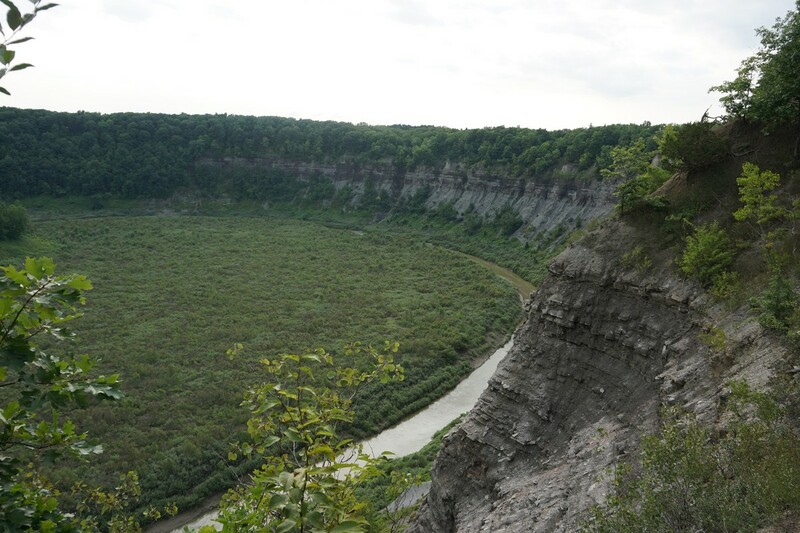 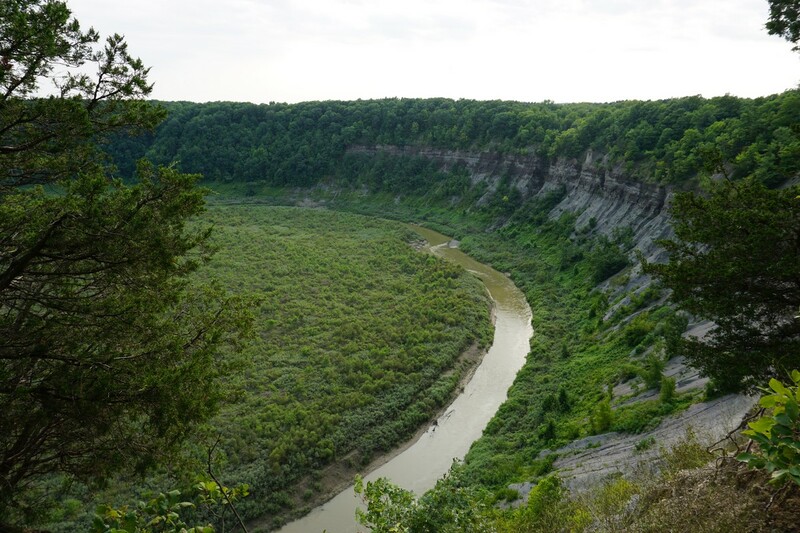 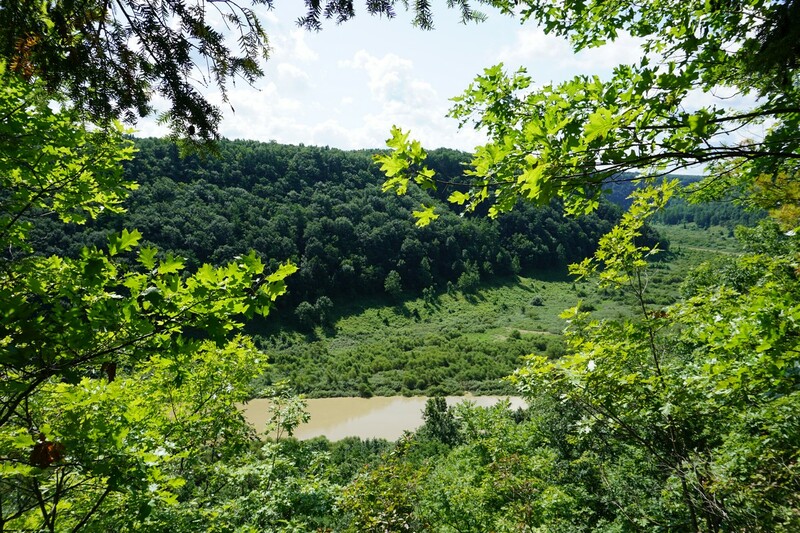 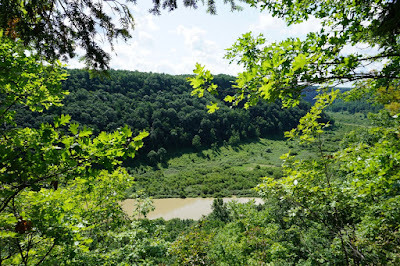 I had spent the week camping in Letchworth State Park and the Genesee River Gorge, and there is a trailhead to a scenic point in the Gorge which starts directly from the campground. I decided to hike this trail, which is somewhat of a loop. 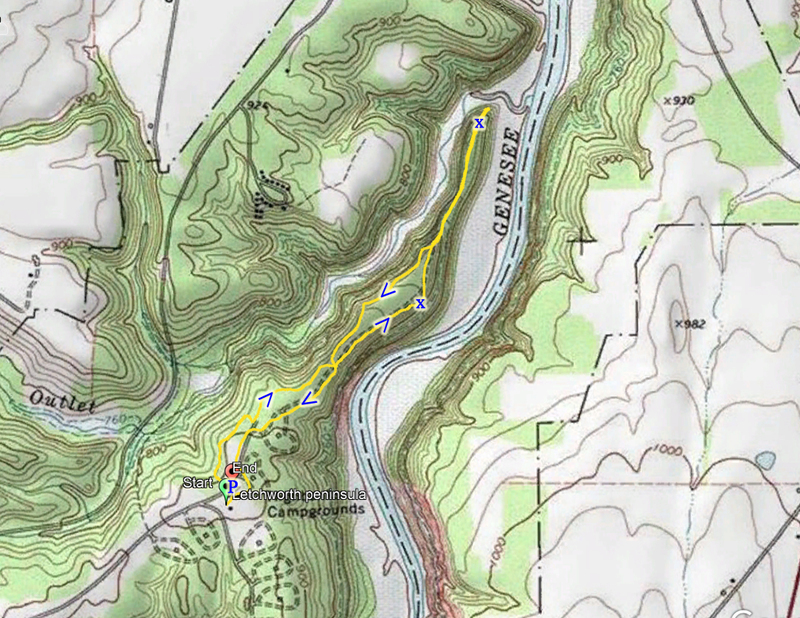 The main part of the trail starts along Park Road, but it has a point of entry from the camping area. 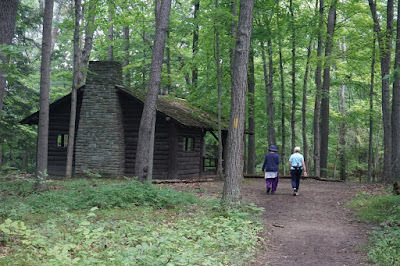 I walked from the rec hall and playground into the woods, where there is a very short path connecting to the trail which goes parallel to loop 100 and 200 of the campground. I took the trail past the abandoned picnic area and shelter, where the trail splits into a left and right spur. I took the right spur, which is above the rim of the Genesee River Gorge, with ocassional good views of the gorge and river below. 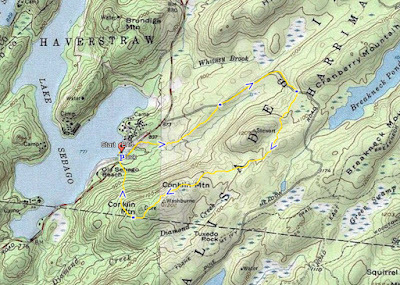 I continued to the point where the left and right spur join, and at this point the trail descends and goes along a narrow ridge along the peninsula jutting between the Genesee River Gorge to the right and the Silver Lake Outlet gorge to the left. 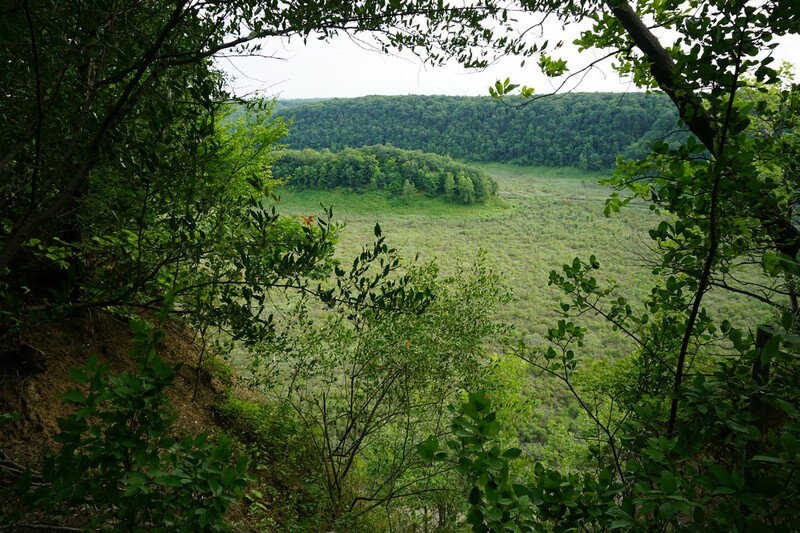 The trail sort of ends at a nice view above the drop, but there is a very steep and eroded trail that descends to the bottom. I took this trail, which is extremely challenging, and when I realized that I may kill myself if I go all the way to the bottom, I turned around and went back up, catching my breath. 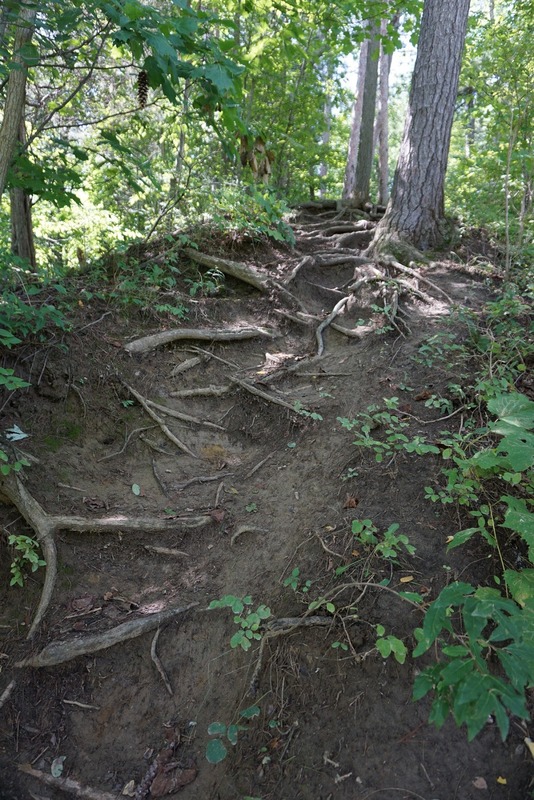 I made it about 2/3rds down and noticed how unsafe, unstable, and steep this trail is to the bottom. 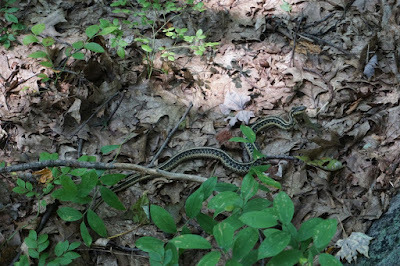 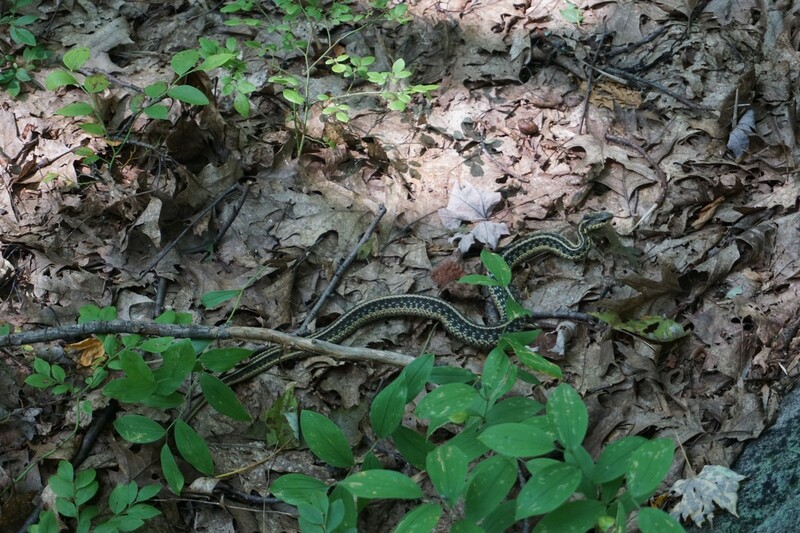 I safely and carefully climbed up holding roots and small trails along the steep path, avoiding the poison ivy which seemed to be growing everywhere. 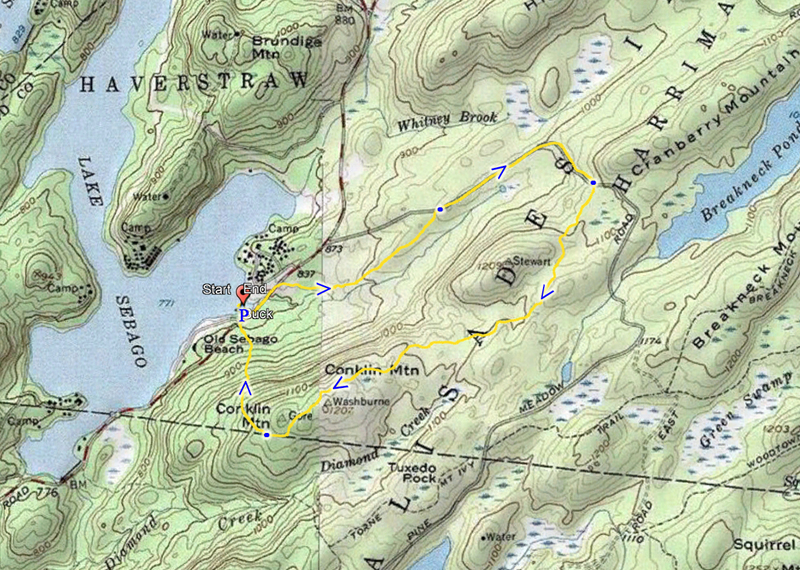 Once I got back up and caught my breath, I continued back up the peninsula, this time taking the spur along Silver Lake Outlet. 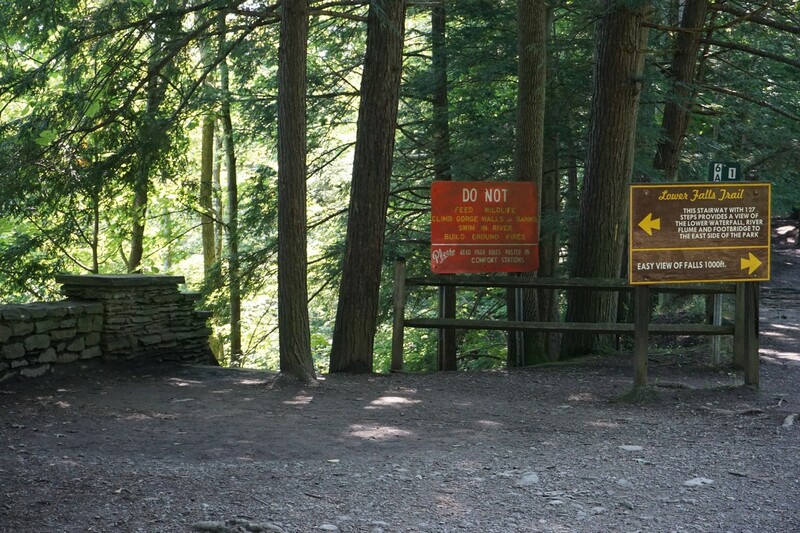 Back where the spurs meet, I took the path that goes directly back to the campground, and walked back through campground loops 100 and 200 where I had originally started. 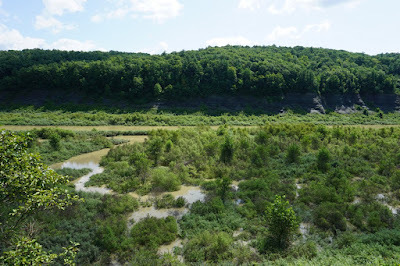 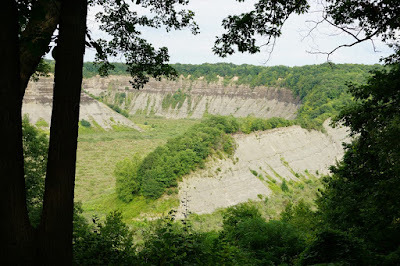 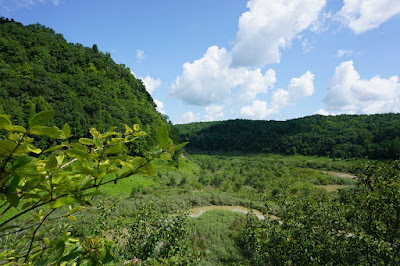 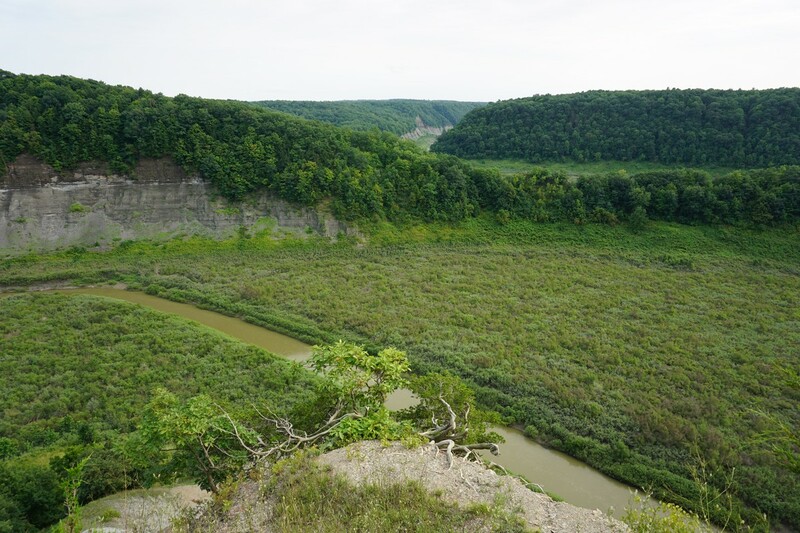 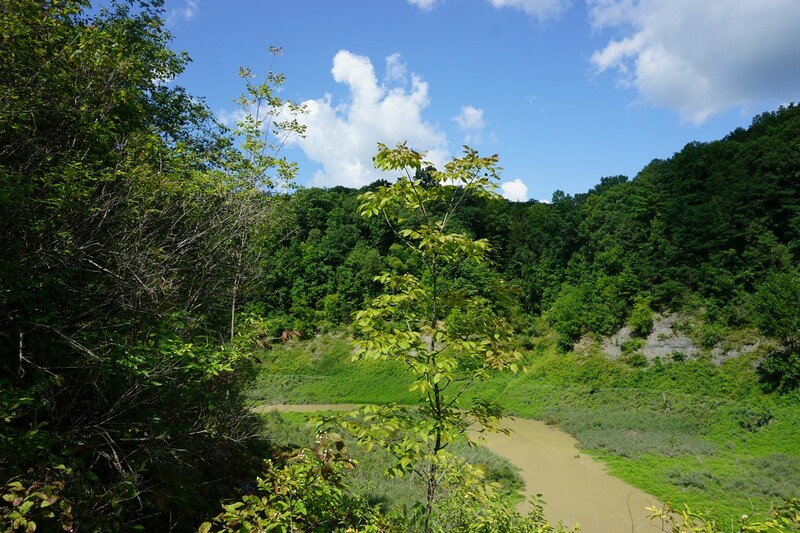 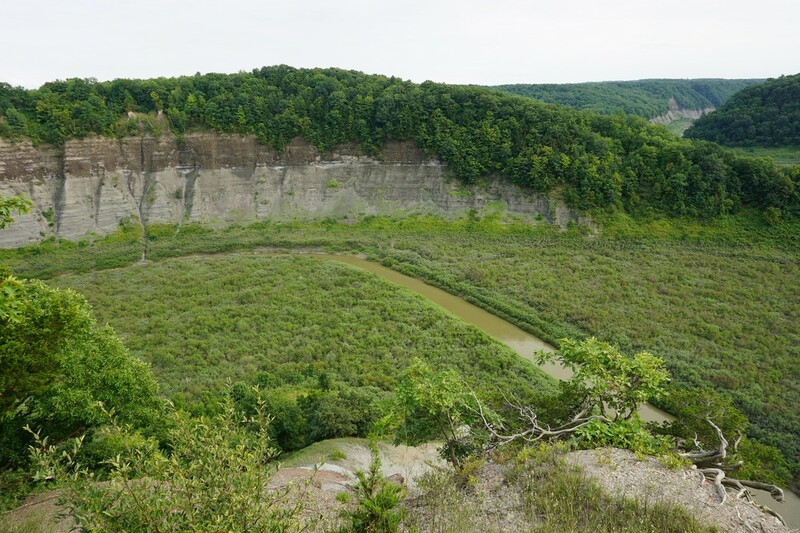 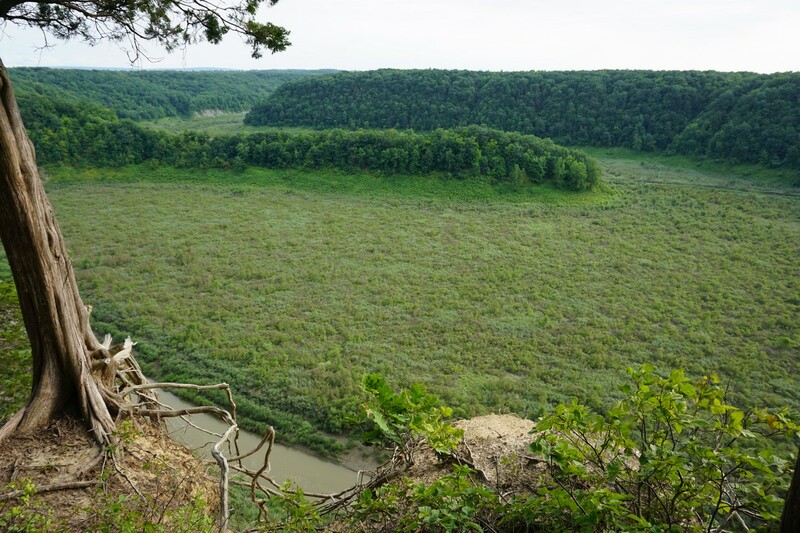 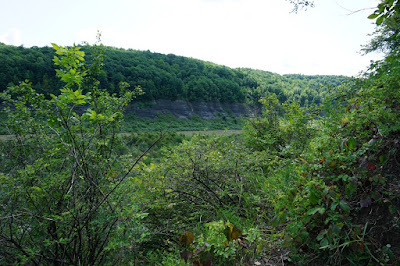 Continuing our camping trip in Letchworth State Park and the Genesee River Gorge, I went to explore the northern area of the park. 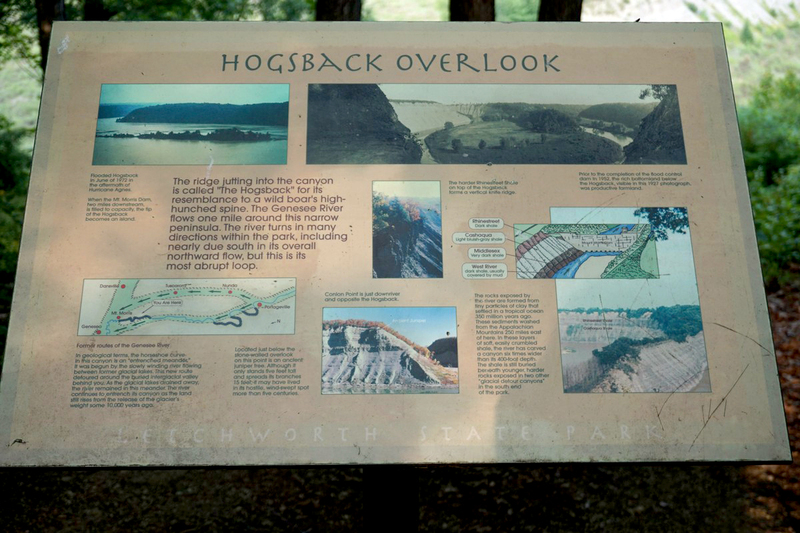 I parked at the pullout for the Hogsback, a formation of rock jutting into the river where it forms a bend around it, resembles the back of a hog. At the parking area there is a nice view. I took the Highbanks Trail north, where it goes along western rim of the gorge. 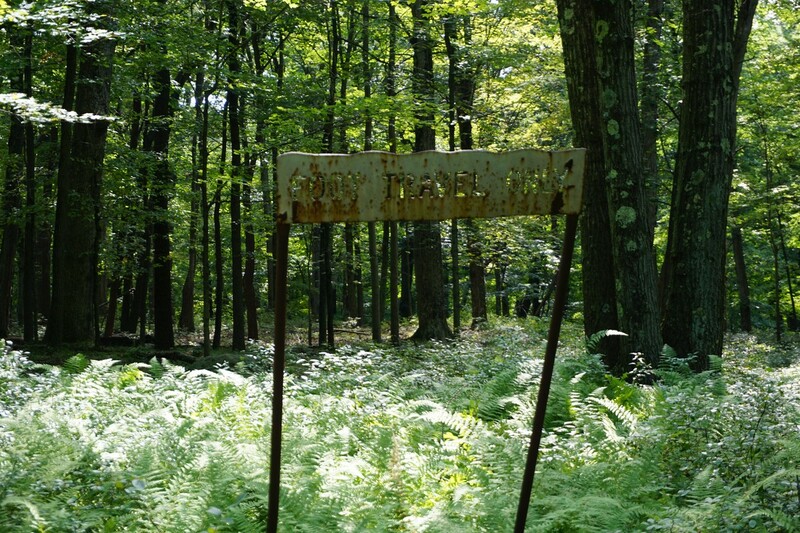 The trail starts mostly as a standard hiking trail, but then goes into some grassy areas approaching the pool area, and then goes on a paved path for much of the way behind the pool. There are some excellent views at this part where the rock formation juts into the gorge as a high peninsula. 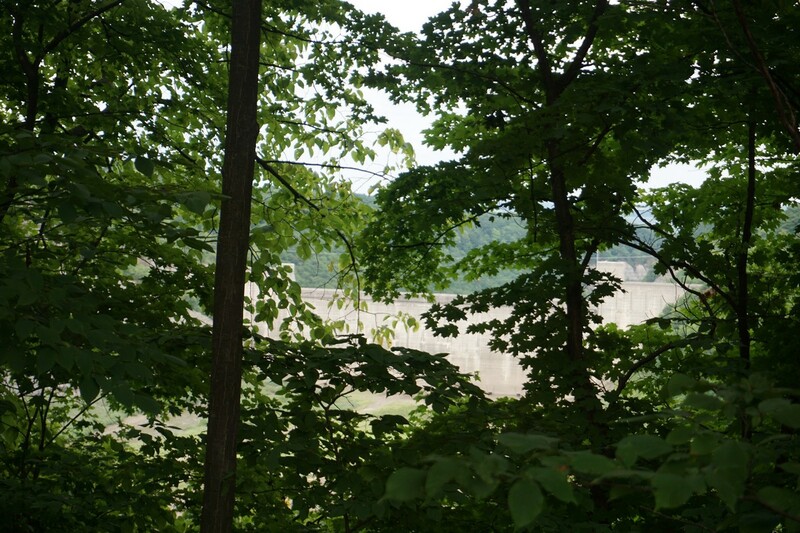 I continued further north past the pool area towards the dam, but ran out of time at this point to get all the way to the dam lookout, so only got some poor views of it through the trees. 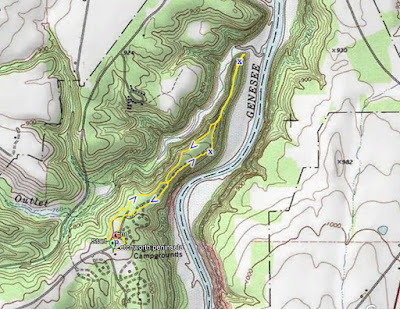 I then turned around, cut across the grassy picnic areas by the pool for a straighter route, and then back to the trail and back to my car. 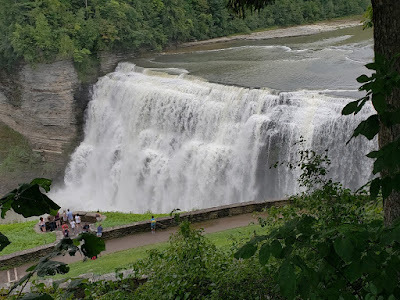 I had travelled on a camping trip with my family to Letchworth State Park. 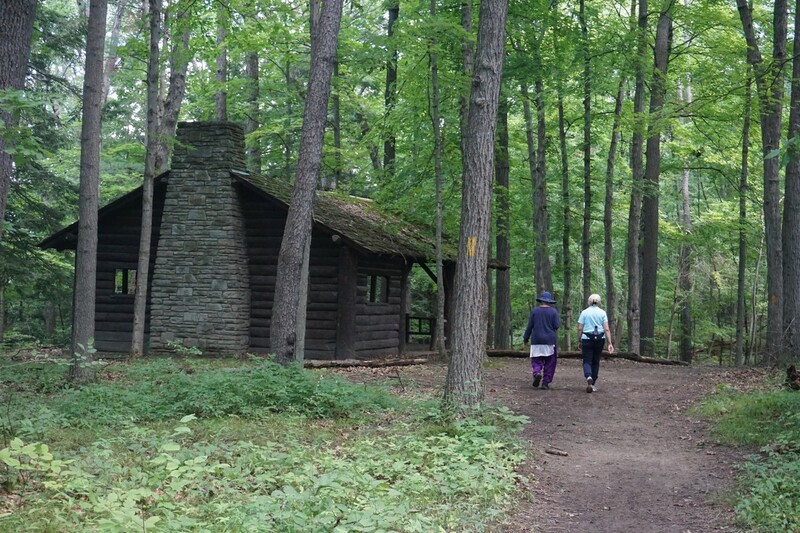 A yearly tradition in the summer, we spend a week in the wilderness, sleeping in a tent and having a barbecue and bonfire every night. This year, our trip was to Letchworth State Park, in the Western edge of the Finger Lakes Region of New York. 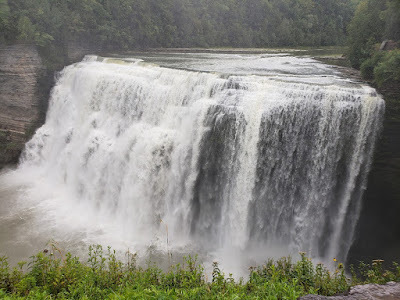 Letchworth has a nice campground and many ameties as a park, including great scenery, a nature center, museum, pool, and recreational facilities. The park has many miles of hiking trails around a large gorge formed by the Genesee River, with some spectacular canyon walls and raging waterfalls. 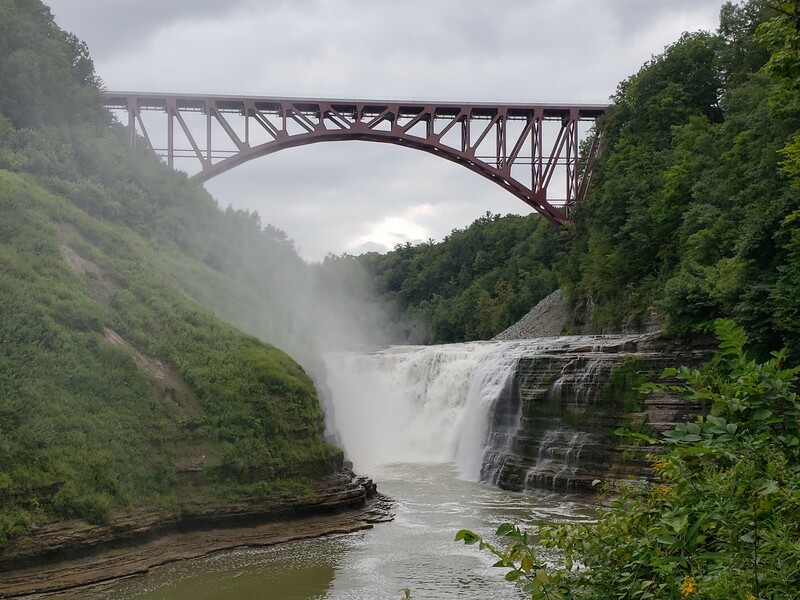 There are three main waterfalls along the Genesee River in the gorge, known as the Upper Falls, Middle Falls, and Lower Falls. The Middle Falls is the most impressive, with a large drop of approximately 107 feet. 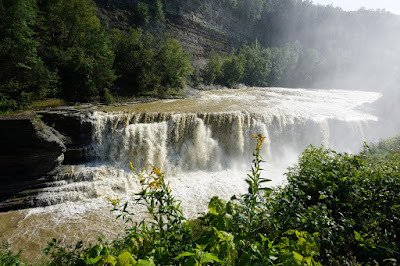 In my opinion this is the most spectacular waterfall in New York State outside Niagara Falls. 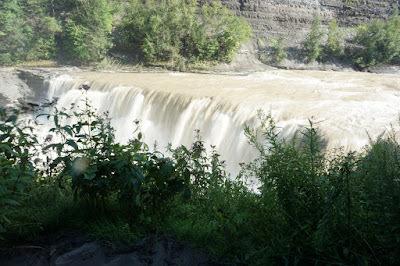 There had been much rain in the previous weeks, which added to the spectacular nature of this waterfall. 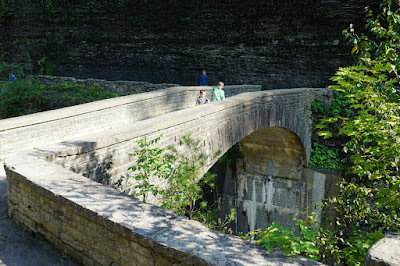 We parked at the parking area by the Glen Iris Inn, and went to the overlook above the falls. 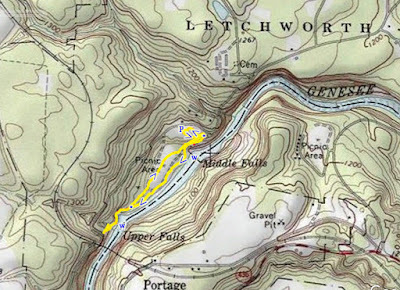 We then took the Gorge Trail behind Glen Iris Inn, down the steps, along the side of the gorge and the falls. 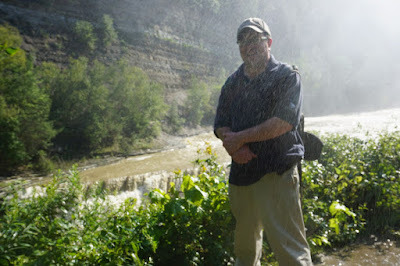 We continued along the edge of the falls, past the drop, and then to the Upper Falls. 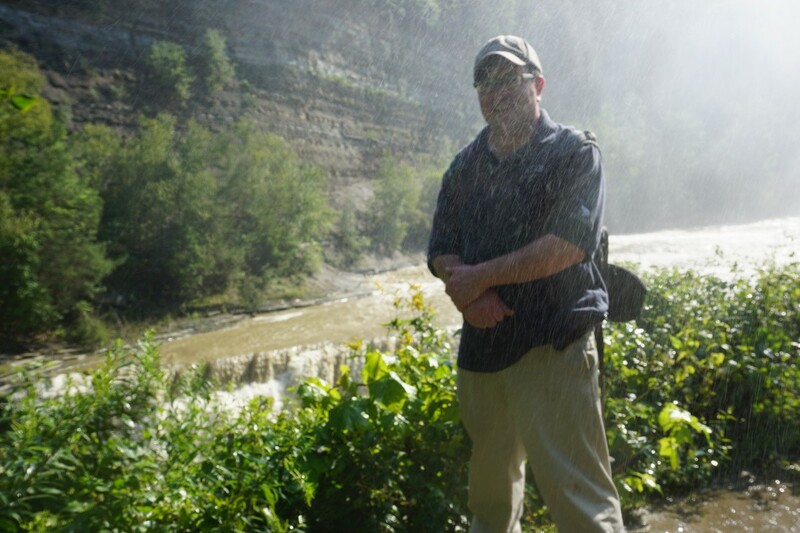 The Upper Falls are less impressive, through feature a very unique horseshoe with a large arc of dropping water. We took the steps up along the Gorge Trail at the Upper Falls until they ended where the trail was closed for the rail bridge construction. 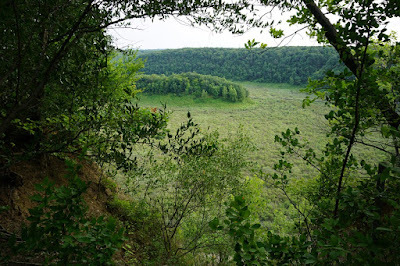 We went back down the steps, then walked through the field. 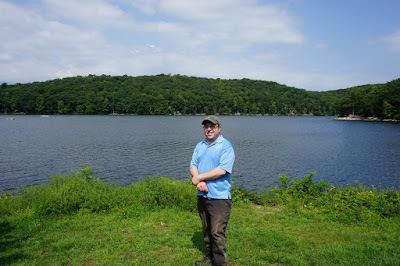 I then walked back up and around and back to the car.